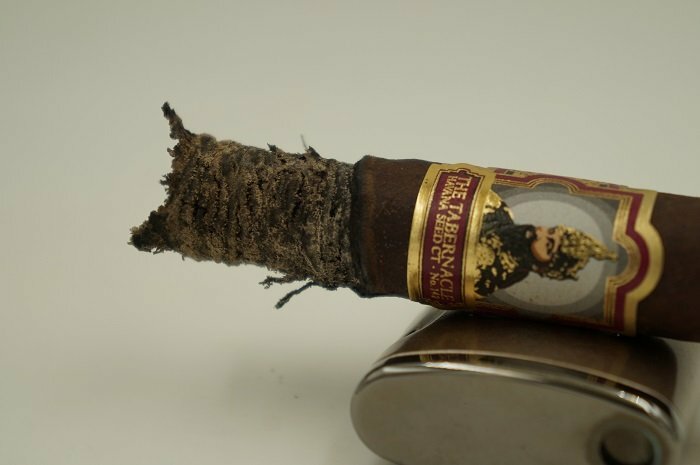 The cigar is rustic looking with a dark brown color that has some lighter marbling along with a network of veins, of which some are raised. The seams are smooth but visible in some places due to vein placement. The head is finished off with what appears to be a double cap and has some dried adhesive present. The band is the traditional Tabernacle design except this line has some burgundy borders and additional details of the line. The aroma from the wrapper is barnyard and mushrooms while the foot brings leather, hay and some sweet tobacco. The pre-light draw brings some stone fruit sweetness and a light wood. 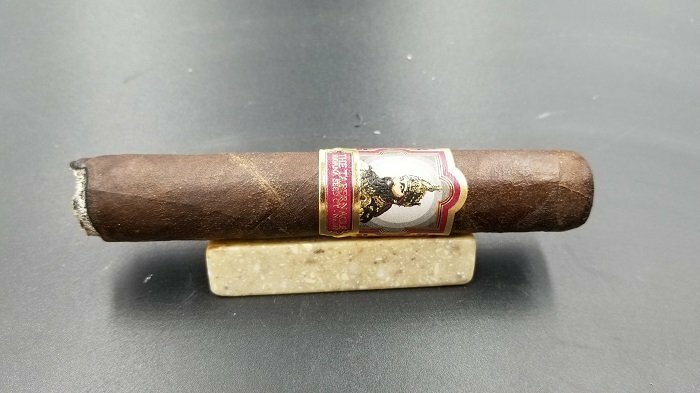 The Foundation Tabernacle Havana Seed CT #142 Corona is well constructed and comes with a very thick, firm and dark wrapper. The coloring is that of a Dark Natural/Oscuro coloring, and it sports small veins throughout. These veins are small, but plentiful. There is an aroma of leather, rich earth and cocoa on the wrapper, and the foot is showing some qualities of stone fruit, rich earth and spices. 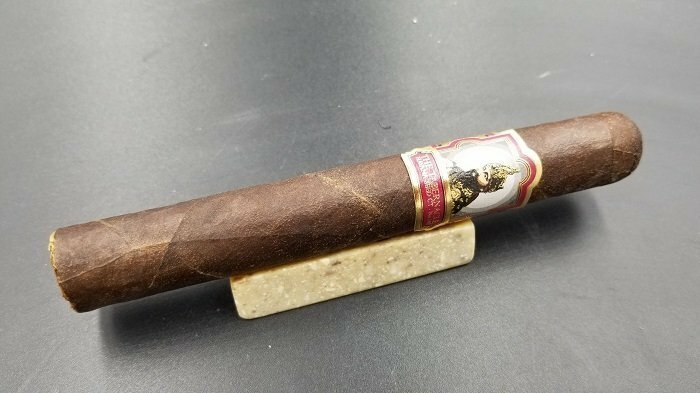 The Foundation Tabernacle Havana Seed CT #142 Corona has a beautiful maduro to oscuro wrapper shade. The wrapper shows great oil content as well as uniformed tooth. Bunch and roll is even with no soft spots, veins well pressed, seams tight and head wrapped with a thick cap. Aromas from the wrapper give cedar and hay. Aromas from the foot tell sweet cedar and white pepper. Cold draw gives cedar and hay with white pepper on the lips. 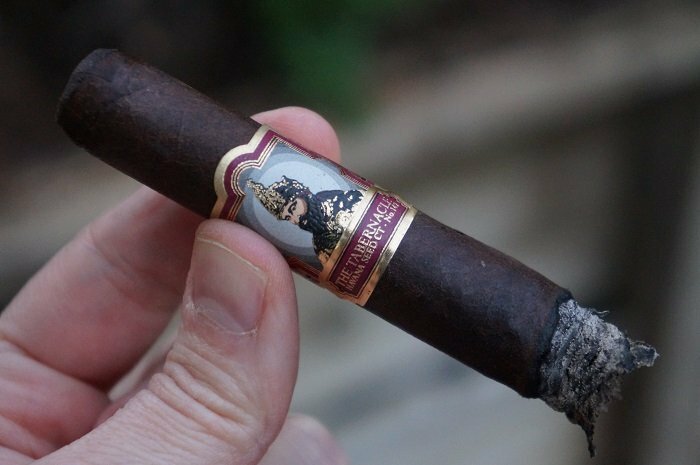 The cigar begins with spiced wood, which isn’t quite cedar, along with a mushroom mustiness. At three quarters of an inch in, the mushroom note becomes more entwined with the wood and baking spice which now show as separate notes. The retrohale has the baking spice up front which just allows some wood to be detected in the background. At an inch in, the baking spice has picked up a bit. At an inch and a quarter, the baking spice mellows and the mushroom note increases. The retrohale now carries an even mix of the wood, baking spice and mushroom note. As the third comes to a close, the wood gains a toasted note as the baking spice and mushroom notes maintain their levels. The strength in this third was mild-medium. The first third has a nice soft spice beginning and it is showing some faint creamy qualities with that. There are some noticeable stone fruit flavors and with that is some chocolate, rich earth and red pepper. It has a great flavor profile and it has a medium-full strength and body. Very great start to the cigar and a fantastic first third. The first third gives an abundance of creamy milk chocolate and sweet cedar. There’s also bread, yeast, fudge, dank earthiness and a hint of white/black pepper. The pepper is more realized through retrohaling the cigar (as is the creamy bread and chocolate notes). The finish is medium in length with a hint of white/black pepper on the tongue, cedar and earth. Strength is medium, body is medium plus. As the second third begins, the toasted wood is now slightly charred wood as the baking spice and mushroom notes continue on. At a quarter inch in, the mushroom note transitions to a general mustiness. At three quarters of an inch in, the charred wood has picked up while the baking spice has lightened and the mustiness is fairly faint. The retrohale is charred wood and mustiness. At an inch and a quarter, the baking spice is gone while the mustiness has increased a bit and the charred wood is still up front. The strength in this third bumped up to slightly below medium. 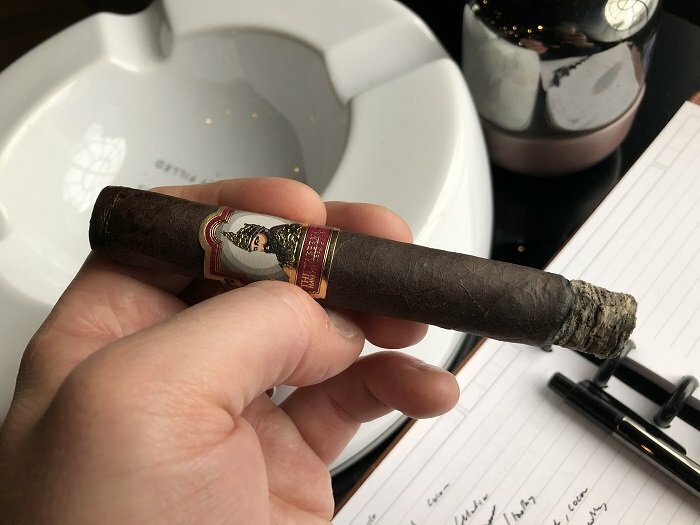 I am in the second third of the cigar now and it continues to deliver some sweet spice, stone fruit and red pepper notes. The chocolate and rich earth levels are still there, and there is this manure and leather quality present on the finish as well. It is still smoking at that medium-full level, and it has a nice richness. The second third tells a spicier flavor profile. The white/black pepper transitions into a dry red pepper spice and at times with cinnamon added to it. Even with the additional spice, the other notes (creamy milk chocolate, sweet cedar, bread, yeast, fudge, dank earthiness) are all still intact. Strength midway through the cigar moves to medium-full and body stays medium full. As the final third begins, the mustiness has increased to become even with the charred wood. At three quarters of an inch in, a slight floral note joins in with the musty charred wood. The retrohale carries the same profile. 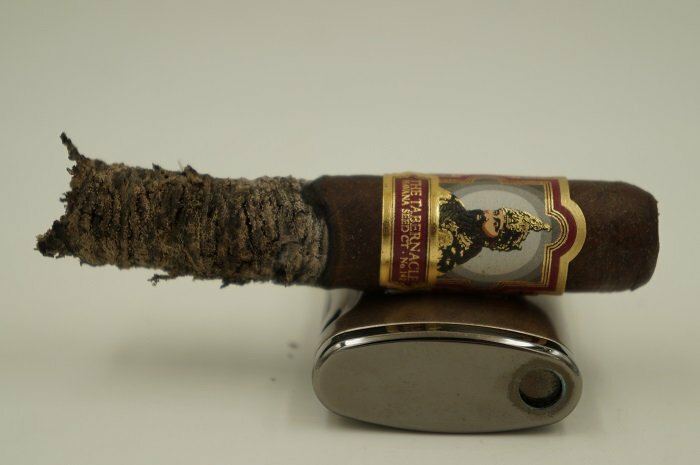 As the cigar comes to a close, the floral note becomes a bit more pronounced but still behind the musty charred wood. The strength in this third remained at slightly below medium. The last third still has medium-full strength and body delivery of dry red peppers, intermittent cinnamon, creamy milk chocolate, sweet cedar, bread, yeast, fudge and dank earthiness. What’s most interesting is an introduction of tannins hitting especially the rear palate and somewhat towards the back of the throat. The burn line was slightly wavy throughout. 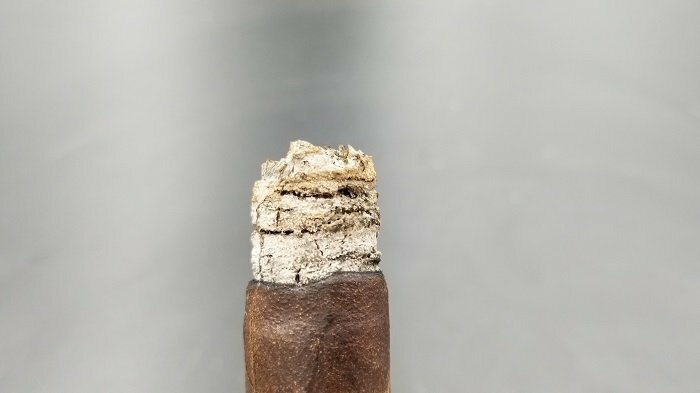 The ash held on through the first third and then held on again in a two and a quarter inch increment. 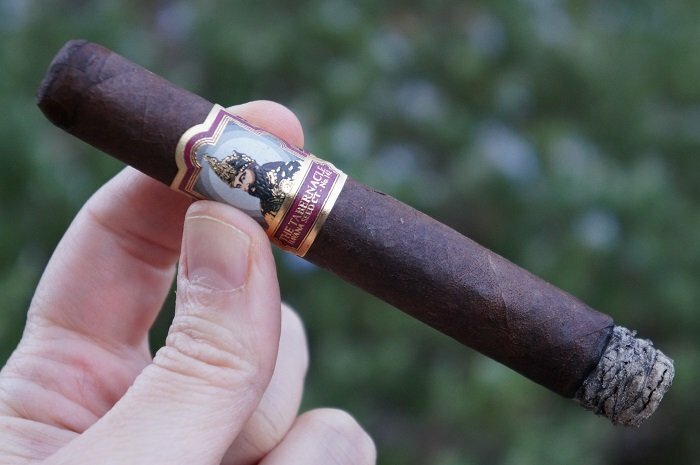 The cigar had a great draw from beginning to end, and beside producing a great bit of smoke, it was cool as well. This is a well constructed cigar. The draw was a bit snug for the two samples smoked but nonetheless, very good. 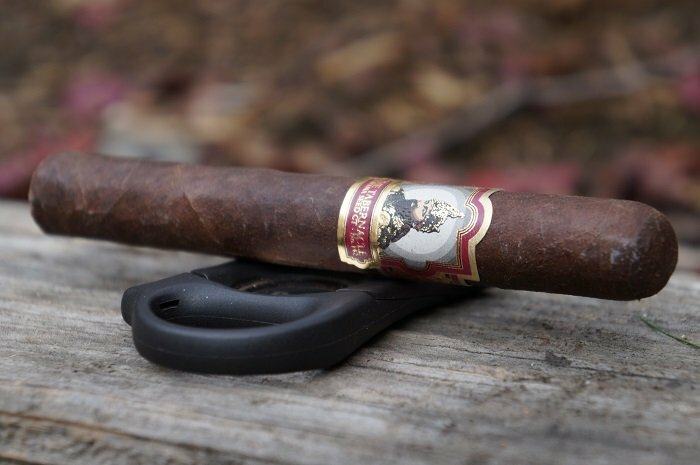 The cigar began with wood, baking spice and a mushroom note. The mushroom transitioned to a general mustiness. As the cigar progressed, the baking spice dropped out and the wood gained some char. The final third added a floral note. Construction was very good and allowed me to just focus on flavors while strength was slightly below medium. This is a nice addition to the Tabernacle line and one I can see lots of people liking. 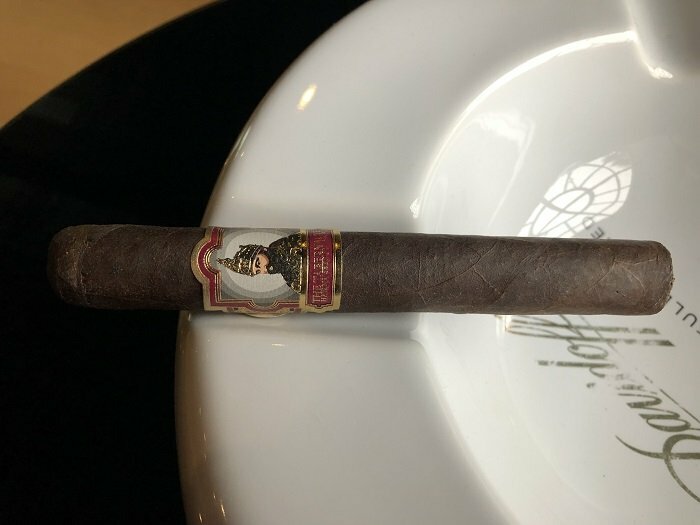 The cigar didn’t wow me, but I could see myself smoking more of these. I’m very interested in trying the other vitolas to see which one provides the best experience. 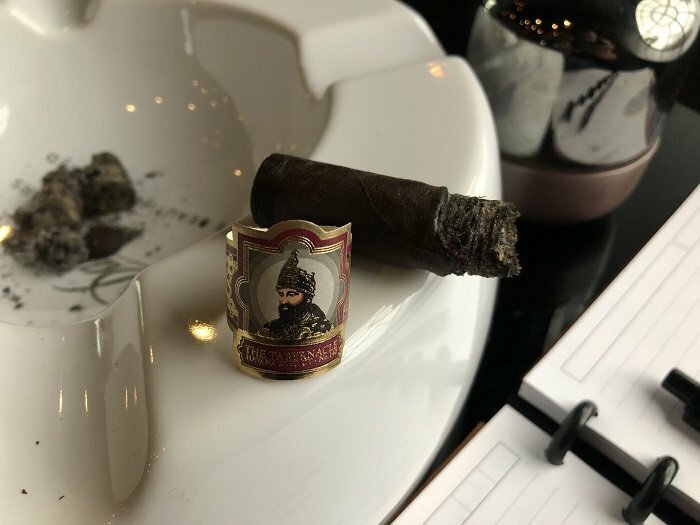 I really enjoyed the Foundation Tabernacle Havana Seed CT #142 Corona and it is great to see where this cigar has come from 2018 IPCPR to now. 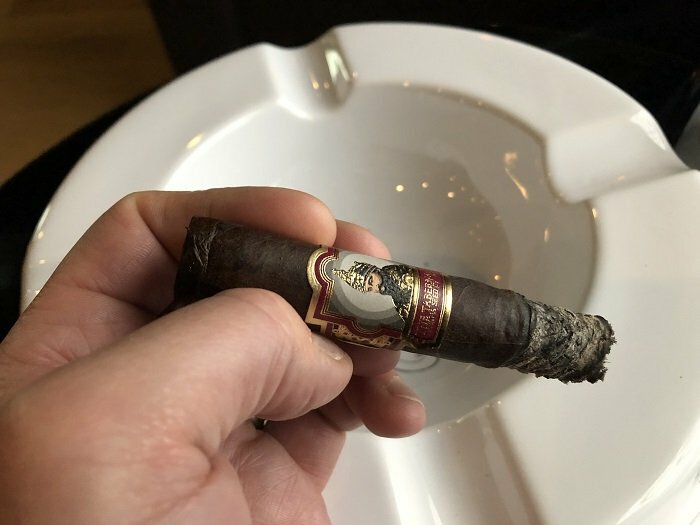 Time has done great things to this cigar, and I still believe that it will improve with some more age. This is a tough wrapper to use, as it is difficult to get fermented and aged just right, but when you get it correct it can produce a great bit of flavors. This was a complex blend and showed so many enjoyable qualities. It was rich and the stone fruit notes were fantastic. The creaminess aspect was very enjoyable as well, and it added a nice uniqueness to the profile. 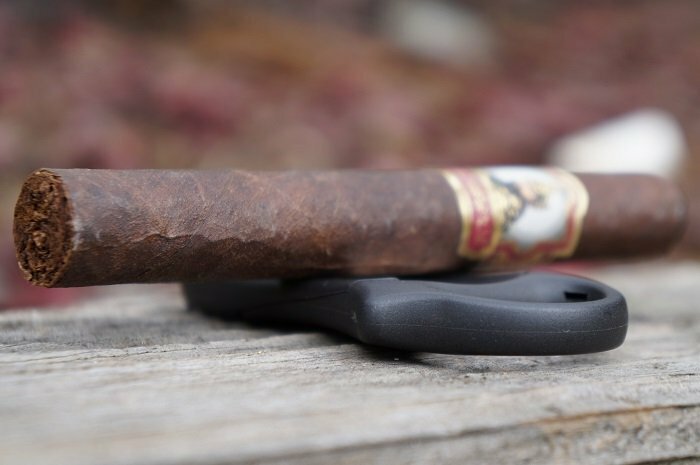 I do think the blend is superior in the Toro format, but for a shorter smoke you can’t go wrong with this offering. Box purchase. Need I say more? I should and I will. 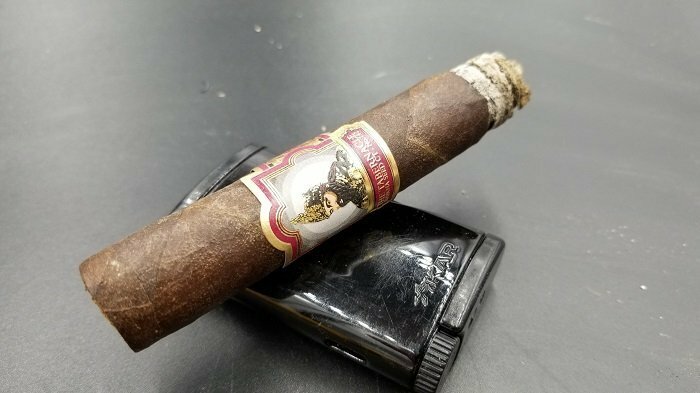 I’m probably one of the very few cigar geeks that dislikes heavier cigars such as broadleaf (as a matter of fact I can be a downright hater). 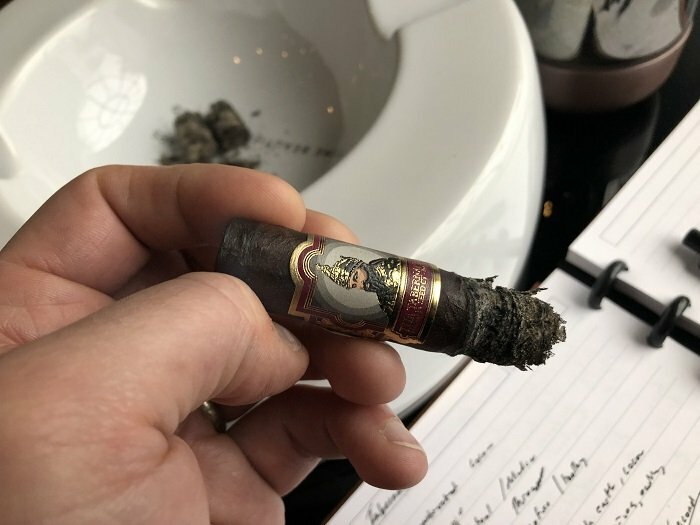 But in the case of the Foundation Tabernacle Havana Seed CT #142 Corona, the pure number of full flavors ranging from sweetness in chocolate, bread to spices such as dry red peppers and cinnamon made me engaged the entire time. So engaged that every draw made me say “dang this is legit.” Excellent job by Nick. 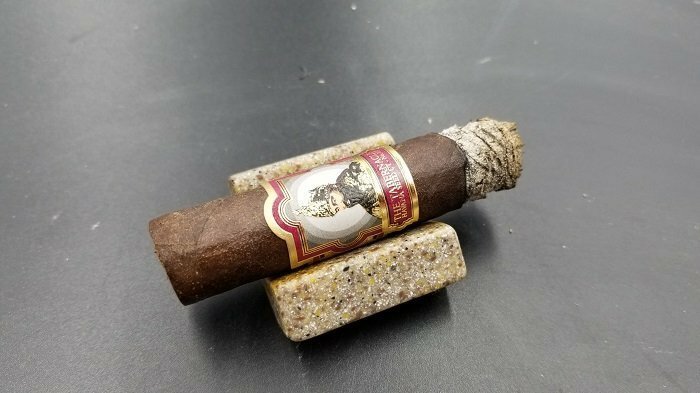 Is this the recommended and best vitola of this offering and are the flavors better on the palate than the wise man maduro?